Cornwall Ontario – Brenda Norman is a petty political toe rag that has now bit the hand that’s fed her. Not even from Cornwall, but from Quebec, she embraced the worst elements of the clique to get her Garlic Fest up and running making it yet another poorly attended clique event that you didn’t really know about unless you listen to Corus radio, which fewer people seem to be doing every year. Now she’s made some damning statements to Maclean’s magazine. A Canadian National tradition for generations. Following Councilor Bernadette “Bernie” Clement’s lead she moved her fest from Lamoureux Park to NAV Can. Not sure why as it’s harder for those without cars to get to NAV, and of course our Park needs to be used and generate cash for the city. Likewise, there’s a slim chance that attendees might spend some dosh in the downtown core (if the stores are open). Frankly this writer is not sure why so many events have moved to NAV, but the one consistency is that they’ve been limp and poorly attended. 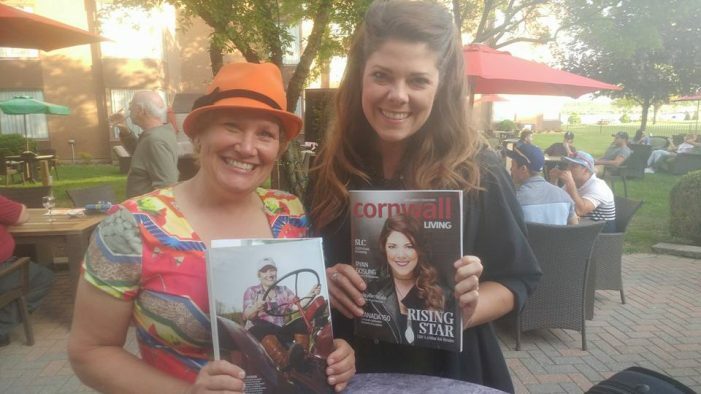 MACLEAN’S magazine just did a brutal story highlighting Cornwall’s racism, and how it impacted the Garlic Fest. When word spread, festival vendors started cancelling out of spite toward the migrants and locals suggested they wouldn’t attend, as the supposed family affair became intertwined with the politics of illegal migration. While the organizers fought for the show to go on, the garlic festival brought out remarkable resolve from local people who insisted that racial tolerance would prevail in their hometown. And there’s a ton of racism. If you view what this writer calls “anti-social media” far too many have called the refugees “animals” suggesting Nazi like terms of disease and worse for those simply trying to make a better life for themselves. Again, wouldn’t a built in extra audience of hundreds be a good thing? These folks after all had mostly been leading lives in the US and had the cash to get to Canada. These are not people off a boat with nothing on them but sweat. Many were bandying the latest iPhones etc. “Why aren’t you coming?” Nelson asked vendors who cancelled from the garlic festival. “Did you have an accident? Or are you prejudiced?” She sent out a letter saying vendors who cancelled without a “valid reason” would be disqualified from all future garlic festivals. She then went further to personally invite the refugee claimants to the event. She roamed the hallways of the hotel and introduced herself in French, suggesting they come and share Haitian food or dance on stage. Threatening vendors is never a route to success, but then many of the other actions of Ms Norman, including participating in the Maclean’s story in the manner she did, appearing to trash Cornwall, aren’t terribly smart either. Most people want a better life and most will shave a corner if they think they can succeed. Is that really a crime? In the broadest sense that answer is yes, but reality and perspective can be impressive things. In 2017 do we really want to live in such a strange world where we label human beings animals just because of the colour of their skin or where they come from? Shouldn’t everyone be judged based on their behavior and allowed to prove themselves to be the failure that Brenda Norman is? Cornwall has major issues. Economic, but mostly cultural. This is after all a community that shut down it’s 36 year public art gallery allegedly because they didn’t like a board member who is a minority. This is an area where the school board is spending thousands of public dollars trying to cover up the fact that Principal Patricia “Trish” Brown allegedly ignored requests to remove swastikas from CCVS, a local high school. And while many blame it on the “older” generation of racists and bullies, the simple facts are if young people are raised with racism and bullying they tend to either become them or are more sympathetic to them. Cornwall needs to learn to build instead of tear down. It truly needs to be more inclusive than the show that we keep sharing to the World. But mostly we need to stop letting people like Brenda Norman run amok with our events because Karma is indeed a magical thing, and this embarrassment to the community and her event are her just desserts. What do you think dear CFN viewers? Did you not go to the Garlic Fest this year? Was it because of refugees or because you didn’t know the event was on? You can post your comments below. clique is a word that is interchangeable with herd. As in a herd of sheep. It like it’s “trendy” to have gatherings at NAV now. I might have gone if it was at the park, since I live downtown. However, I don’t like being called racist just because I don’t beleive in illegal migration. Just like people being called racist for supporting Trump, or being conservative for that matter. We have laws. Haitians are not a race. Haitians represent different races. They are not refugees either. The Haitians that have and continue to enter Canada illegally are economic migrants. They are not citizens of the USA and they are not in danger should they return to their country of origin. What we do know is that they have no difficulty in breaking our laws for their own benefit. As to the Garlic Festival. Never heard anything about it until I read this release. Likely would not have attended the event even if I had heard about it. Nothing personal against garlic. Jerry if it is racist being against illegal immigration then I have to wear the badge and I am very Conservative. If I was a racist then how in the hell did I marry a Lebanese born and raised and a Christian Maronite as well. I cant be all that bad being 43 years married next month and how many people today can say that – not many. Hubby doesn’t believe in illegal immigration either. the inbred dolt who wrote this article could have at least left the cozy confines of his mother’s basement long enough to attend the garlic fest. It was very well attended and sales were brisk. If this person thinks there should be more events held downtown, I would encourage him to organize one. Brenda owes nothing to Cornwall, as she is not a resident of the city, a fact noted in the “article”. Hey Jamie, I attended last year’s event in the park (although centrally location) and attended this year’s event ( a bit out of the way) primarily because of the triathlon which always disrupts the east end every year. I found more vendors and bigger attendance this year. I bought garlic and added some to my meat sauce. It’s a matter of choice. Our company Homestead Organics sponsored and attended the three eastern Ontario garlic festivals held in Cornwall. I enjoyed them all. I was somewhat concerned about the change in location as I feared lower attendance given the distance from downtown. Not being on the organizing committee, I trusted their decision. In reality, our table had greater traffic and more sales this year than previously. Tom Manley, that was exactly what I was thinking in the change of venue; the distance from the downtown core. But as you stated, it was very well attended. As previously stated perception is reality, reality is perception. Life can be very weird at times. Jerry Trump is a very intelligent man and he made an empire out from a few million dollars that he inherited from his father. This man knows business and is no dummy at all and no matter how he feels about certain races or whatever he is not alone. The man means business and is doing a good job. I am four years younger and could not do the job that he does with all the stress, etc. You want racism and hatred this Doug Stewart seems to be doing quite a job out of it. Jamie has the best paper in Cornwall and that is the absolute truth. I never met Jamie at all and his style of writing is great. All the other papers in Cornwall are in the ground for mulching or in the garbage can – there is no match at all. Hands down Jamie is the best there is. One time when we lived in Cornwall someone brought us a jar of wild garlic to try. My husband tried one garlic out of it but let the friend take it with him. It was very strong and would kill any living thing. We eat the garlic from the store and that is strong enough.